The Secret Behind the Power of the Dragon? Bruce lee isometric exercise - two words that in physical culture and fitness forums around the world pop up on a near daily basis. Many of us today still marvel at Bruce Lee’s physique. His low body fat and sinewy, steel muscles have inspired dozens of young me to devote themselves to health and fitness in the quest to attain Lee’s legendary physique. Bruce Lee had a very – I mean a very – defined physique. He had very little body fat. I mean he probably had the one of the lowest body fat counts of any athlete around. And I think that’s why he looked so believable. There’s a lot of people that do all the moves and they do have the skill, but they don’t looks visually as believable or as impressive as Bruce Lee did. He was one of a kind. He was an idol for so many. The great thing about someone like Bruce Lee is he inspires so millions and millions of kids out there who want to follow in his footsteps. I know millions of his fans are convinced that Bruce was born with a special body, they have watched him exercise his extraordinary strength, seen his agility, studied him as he flexed his small but marvelously muscled frame. Many of them simply do not believe it when I explain that Bruce built his outstanding physique through sheer application and willpower, through intense training. Intense Training, part of which included Isometrics. Now Bruce Lee was on the cutting edge of fitness and physical exercise. He obsessively ordered every course and book, learned every exercise he could and used them all. He then subjected them to critically evaluation. If any given exercise did not produce results it was dropped. Thus Lee stripped away the non essential, those exercises that weren’t good enough. Only one system of exercise was so successful that Lee practiced it DAILY. That’s right he trained every day in these particular exercises because they produced incredible and dramatic increases in his strength and his muscle density. That system, of course, was isometrics, the same isometrics I teach in my course 7 Seconds to A Perfect Body! In fact Bruce Lee isometric exercise produced the quickest increase of raw strength and dense muscle in Lee's total training experience. After many years the Bruce Lee isometric exercise routine was paired down to 8 exercises that he performed only once each day. That was it. However each of these exercises require a solid base of full body isometrics behind them, and they also require specialised equipment to perform. Rather than have people risk injury (much like Bruce did), I teach the full body course with equipment free versions of those techniques in my 7 week isometric course - 7 Seconds to A Perfect Body! and you can see my perform some of Bruce Lee's strength feats having used those same methods. In addition to his regular martial arts training and workouts, these simple 8 isometric exercises built the body of a Dragon and can do the same for you. Have You Tried the 8 Bruce Lee Exercises or Want to Start? Then share your experience or ask your Bruce Lee based questions here! Bruce Lee was a huge inspiration of mine, and as Arnold says above to many more kids and athletes today. Isometrics were a core part of his training program and helped him build one of the most inspiring, functional physiques of our age. how much share of success the food that bruce lee used to have, had influenced his physique? what was his forearm workout? ok so i'm a gymnast and so many people tell me i have the body shape like bruce lee, but ive been trying to get forearms like him any ideas? Great Bruce Lee Speed but Effective? Hi, I would like to increase my speed. Do you have any exercises to increase 100m sprinting? Building Big Muscles, Does it Sacrifice Speed? 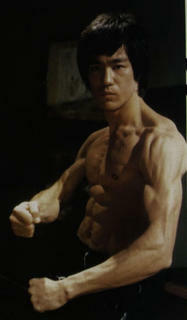 i want to get ripped like bruce lee how can i get? I always did workouts but nothing has happened. Any tips on good speed, abs, and jumping high for my Martial Arts. Looking for better, safer exercise for hypertensive and diabetic patients. I would like to try the Bruce Lee exercises..
At what age did bruce lee start to work out? Like, did he work out before 1964? Bruce Lee Isometric Exercise revealed. Now, start learning the exercises here.